We used to have our flower shop in a strip mall on the south side of town. The fact that it was 20 minutes from my house - and in a strip mall - left me yearning for a more ideal spot to design flowers. When I started thinking about a new location, so many considerations came to mind, the biggest one being the constant battling roles of being a mother and a florist. I remember Valentine’s Day 2017 when my son got the flu, and he had to spend four days leading up to Valentine’s Day on a sleeping bag under the front desk at my shop so I could keep an eye on him. It was a particularly stressful adventure. That was just one of the many times that my guilt seemed to outweigh the pleasure of doing flowers. I decided that I needed a place to do flowers that would somehow blend motherhood and work in a better way. That is when I hatched the idea of having a flower house. 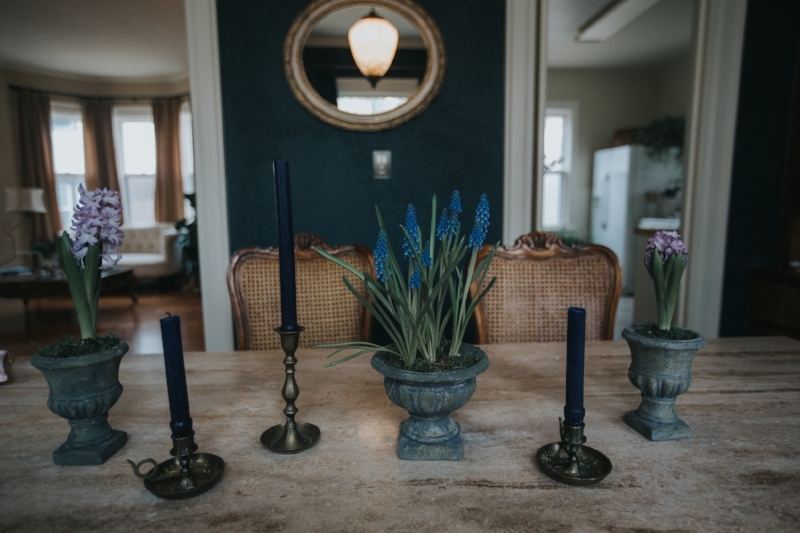 I started looking for homes on the north side of Sioux City (closer to my actual home) that would have a good basement for my flower studio while having a nice rest of the home for my kids and husband to live during busy flower times. Some people have second homes on a lake or at a ski area or on a beach…but I needed a flower house. I dreamt of a place where I could host all of my wedding consultations in a beautiful space, hold workshops, design flowers, eat meals with my family, and have beds where we could sleep if it got too late or where kids could rest if they were ill. In November, I found the perfect home. It is on the north side close to my in-laws, the kids’ schools, the Sioux City Country Club where the kids can swim in the summer, and only 5 minutes away from our actual home. It is a darling house home built in the 1920s and has so many incredible old, amazing details in it. It was badly in need of a facelift, but it had everything we wanted, so we bought it and set to work. 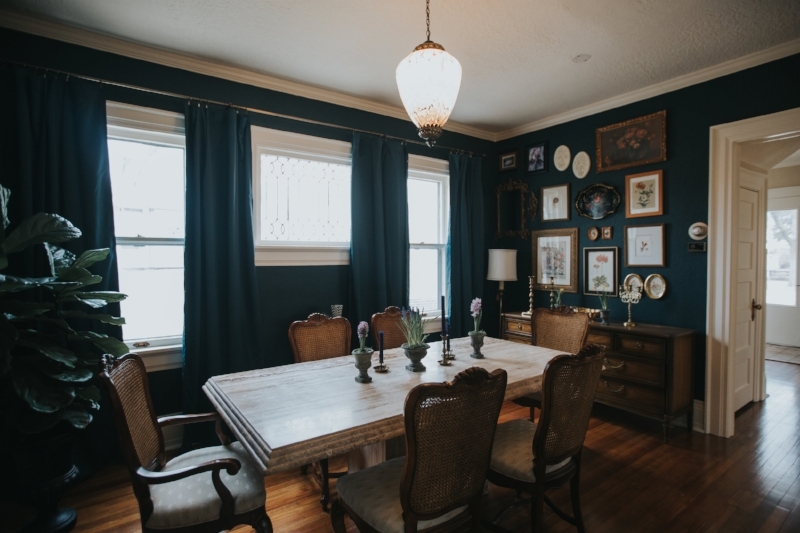 We spent the winter painstakingly picking out paint colors, having the hardwood floors refinished, and furnishing this beautiful home to bring it back life. We absolutely LOVE this house. It is amazing to work in such a beautiful and inspiring place! 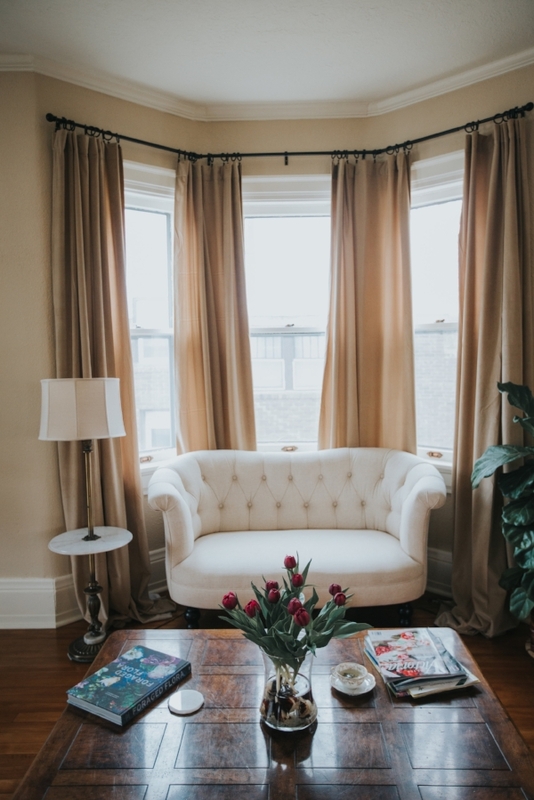 The natural light streaming in from all of its windows is just so picturesque that I often find myself looking for a camera to snap a picture. I have to send out an ENORMOUS thank you to Summer for doing most of the interior design in the home. 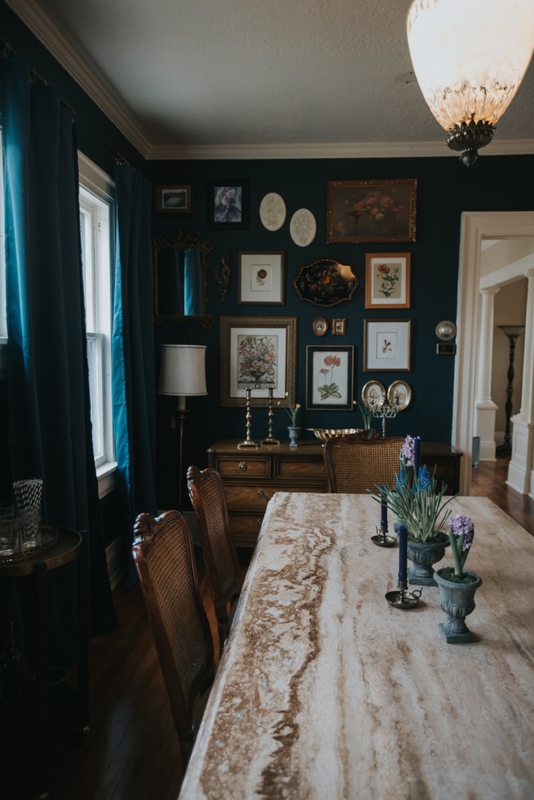 She and Everly, my daughter, worked to bring my vision of old-world opulence back to this home. I had so much fun antiquing for furniture, mirrors, light fixtures, furniture and art work to decorate the house. I had only to bring it and set it on the table for Summer, and she would artfully style it. I am so fortunate for her good taste and vision. I see her use her eye for design on a regular basis for wedding design, but she really went all out to decorate our Flower House! I could not be any happier. Jenni of Jenni O Photography came down to photograph our Flower House and she got some wonderful pictures of our space. She does wedding photography, as well as realty photography for homeowners and real estate agents, so we were particularly fortunate! She also helps small companies brand themselves with photographs of what they do to bring their stories to life, so she was here to capture us doing what we do. It was such a fun afternoon having her with us! Here are some of the photos she captured. I also snapped a few fun pictures myself. I think my favorite room in the house, if that is possible, might be the dining room. Everly picked out this gorgeous blue/green color called Narragansett Green. Narragansett is a bay on the north side of Rhode Island Sound, and this color makes me think of water—sometimes it looks dark blue and others it has a green tint. I love paint colors that change with the light; they seem to have such depth. 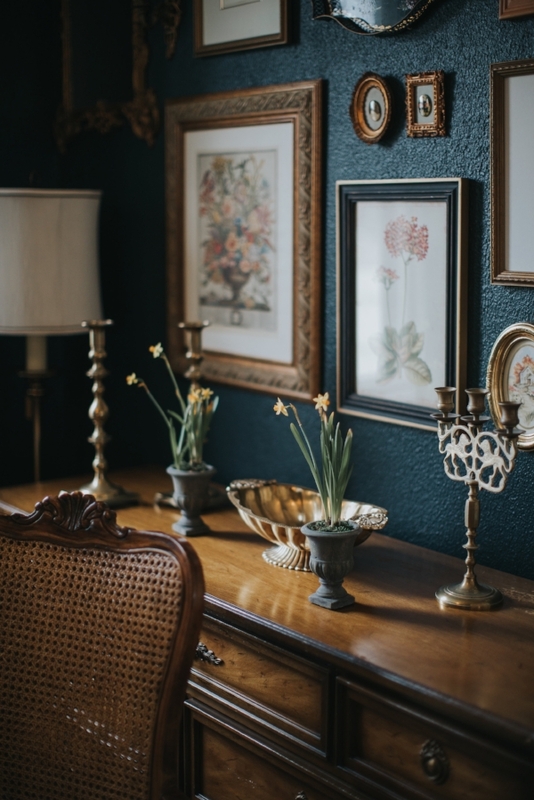 I also love the gallery wall full of vintage prints, mirrors, a hand-painted tray by my Grandmother, and other odds and ends that Summer styled for me. Oh, and the travertine stone table that I found on craigslist in Omaha is amazing and durable. It won’t matter how many vases of water we spill on it during workshops, it will hold up. And the amazing light fixture that came with the house! Oh, and I love my milk glass collection displayed in the built in hutch. Yes, it has to be my favorite room in the house! Here are a couple more photos from Jenni. Thank you to my parents for bringing the amazing bedroom set for the master bedroom all the way from Idaho, and I also love my childhood beds in the blue bedroom. Like I said, there is so much to love about this old house---the ornate door knobs, the old light fixtures, the gleaming hardwoods, the sunporch off the upstairs tv room, the staircase, the trim, the pillars into the living room and so much more. Pinch me! Thank you to Alyssa and family for all of the family heirlooms you gifted us for this house. And a big thank you to my Gramma Bette who gave me her mother’s (my great grandmother’s) camelback, blue velvet sofa from 1930. So fun to have a part of my Great Gramma Spoerl with me at the Flower House. Thank you to my Aunt Liz for driving it to me from Virginia! So many people gave us special items to make this house feel like a home. And it does. We want this to feel like a place where you can hang up your coat, have a cup of tea, and talk/make flowers. I hope it will be a unique way to provide a flower experience to our customers. I have lots of ideas so I’m so excited about the years to come. “If you build it, they will come”. Yes that is from Field of Dreams, but sometimes it comes into my head here at our Flower House. I’m not even sure yet exactly what it will become, but I’m certain that the future is bright.